Gaijin Games’ Bit.Trip series has had six installments, each dealing with a different type of game style retro-fied and in tune with music. One of the crowd pleasers, Bit.Trip.Runner, took that same auto-runner gameplay and made it more rhythmic and challenging as a platformer/runner hybrid. Gaijin has decided to take what they learnt from Runner and apply it to a sequel. 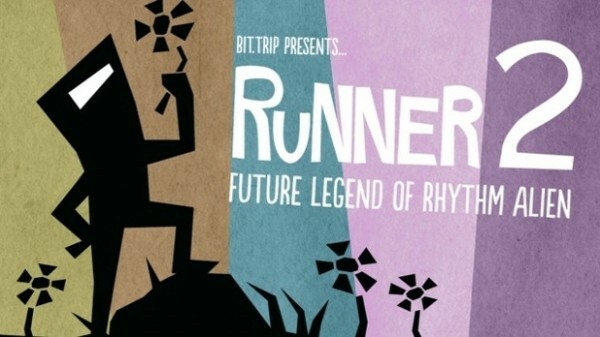 But this isn’t a Bit.Trip game, this is Bit.Trip Presents…Runner2: Future Legend of Rhythm Alien. Runner2 continues what we loved about the original Runner. As Commander.Video, you’re destined to get to the finish and what transpires is a lot of levels of running to the right. But not only just running, you’ll have to overcome a numerous amount of obstacles in your way. Sometimes jumping over them is the simple defensive move or you might have to kick down posts in your way. Sliding under enemies also helps and blocking with your trusty beat blocker will block those beats (alliteration!) You can also dance, but it’s a risk vs. reward style move. What’s new this time regarding the move set is the ability of combinations. Some areas might require you to slide and jump at the same time or slide and kick. It fully utilizes all your move set all the time which means you’ll constantly be pressing different sets of buttons. Something a lot of games don’t do when they just have a button that doesn’t do anything. In Runner2, every move at your disposal will be used so be prepared for whatever comes next. The original Runner had you collecting only two things: gold and plus signs that give you more points and a neat rainbow when you’ve collected all 5 signs. Runner2 adds way more stuff to collect and paths to deviate from. You can now collect treasure chests that unlock new outfits for The Commander and several new characters including Whetfart Cheeseburger and Uncle Dill. Yes, you read those right. There’s also Key Vault Levels that you’ll have to complete to get a key in order to open a new path in a different level. It’s an element that begs for you to replay old levels, and you’ll want to. Sometimes there’ll be that one score on the leaderboard that’s beating you and if you have all the right stuff, you’ll be dancing to the finish line as you laugh at your friends score. The worlds are even more vibrant. Bit.Trip.Runner originally has very pixelated environments but still had a lot of movement with factories and giant worms. Now the 3D graphics come into full fold and make the entire game look like a living breathing cartoon. Giant hills have eyes, factories floating in the distance and stop signs flying right into your face, The world Gaijin has created is even better than their previous worlds for the sense of life that’s brought to them. Another returning favourite is the retro levels, and they’re better than ever. While they originally looked like Atari 2600 games, they had a certain lack of a breathing world. In Runner2, the graphics look like an NES/SNES game with much more colorful sprites, smiling trees, scorpions, pendulums that look angry, the list goes on. Not to mention Fez composer Disasterpeace composes the music straight on an original Famicom. I had virtually no complaints about the game, personally. It’s easy to see how some people might not enjoy the trial & error but that comes with the territory of being a runner and was part of the first title. Each obstacle is placed in a way that feels fair no matter what. And even if you do find problems completing some levels, there’s different difficulty modes and the inclusion of checkpoints will help the most troubled player. If there were one thing to mention, sometimes I personally felt that the new things they added then took away on release kind of made me prefer the changes. For example, The Commander had a cape when he got 5 plus signs instead of the classic rainbow or he was a bit more spry and had more sprites in the retro levels as opposed to the classic Commander look. It didn’t hinder the game in any way for me but I did like the changes that Gaijin were making during development. I was ready for the Commander to look slightly different but sometimes, it’s easy to clamor to the classic look. Other than that, the game is freaking fantastic. It has the right amount of trial & error to keep me wanting to go back and make the perfect scores on every level. There’s plenty to enjoy for every type of player who loves platforming and auto-runners. I would suggest going for the Steam version since the XBLA version has a bit of loading issues that Gaijin are going to patch and the Wii U version is super optimized for the platform and has GamePad-only play. It’ll also be hitting the Vita sometime in the late spring/summer. This is in the running for my current game of the year. It’s a title I’ll likely play forever, even after perfecting each level like the classic Meat Boys or Super Marios of the world. You need to make it a point to play this. Runner2 was developed by Gaijin Games and published by Aksys Games. A Steam copy was provided and an XBLA version was purchased for review.